It only took about 30 minutes to complete. 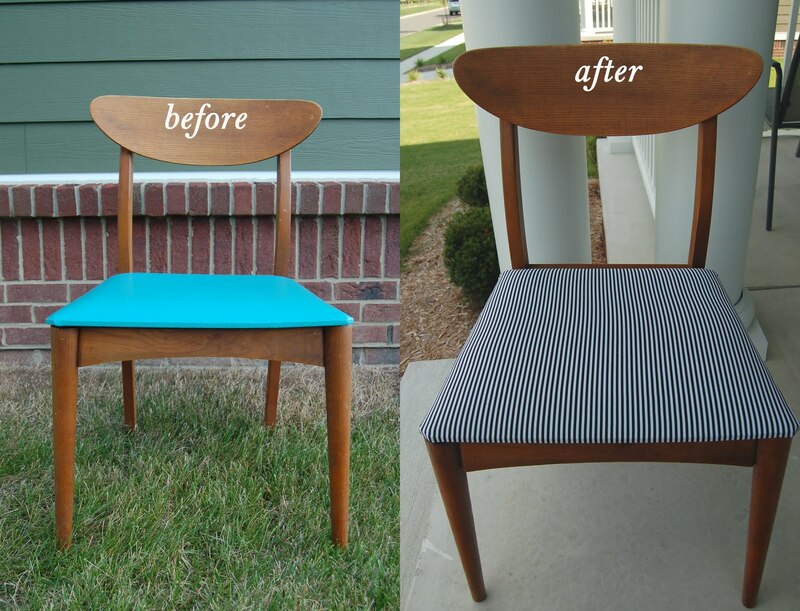 We simply removed the seat, stapled on new fabric, and sanded the wood frame to remove old paint splatters. I love using it in my office, but unfortunately I have to keep a blanket over the seat, otherwise my cats use it as their personal scratching post (& bed). I love the special little touch with the pink ribbon. p.s. that pink ribbon is so cute!! Wow, that looks amazing! I envy these "Oh this ol' chair? It took ten minutes to re-upholster!" projects. Must. Buy. Chair. Soon. Kate - I'm the same way. This chair actually sat in my car trunk all summer before I got around to doing this. But it was WAY easier than I thought! way to go! this is beautiful! 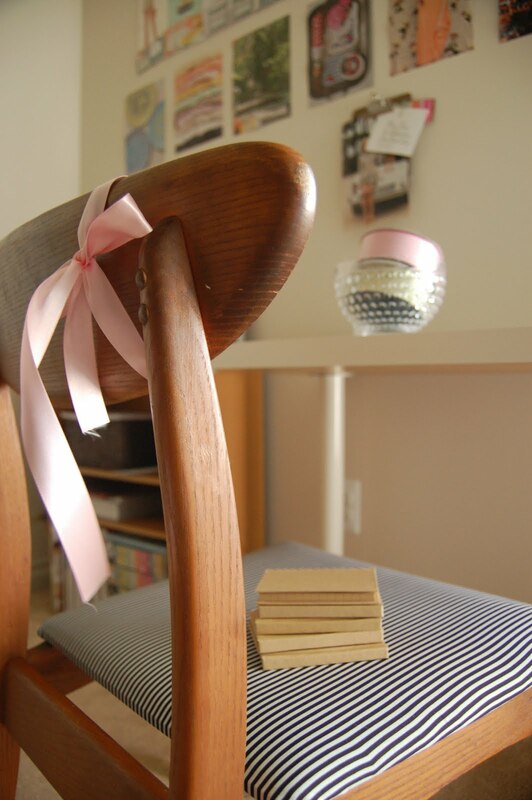 the pink ribbon adds a lovely feminine touch! You did it! I remembered the J crew inspired post you did! 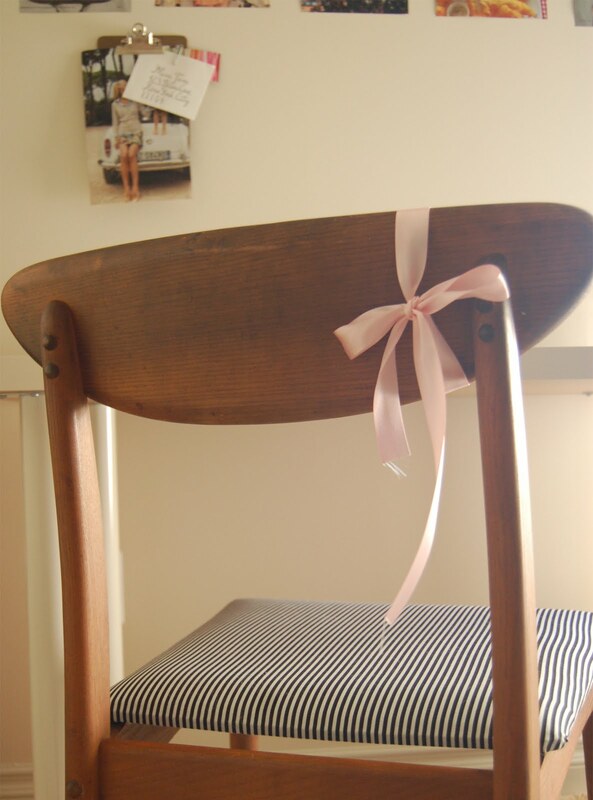 And this chair is beautiful with the choice of your fabric and that ribbon just added a different feel to it. Nice! My cat ruins everything too. I love the fabric you chose and I am jealous you found that fabulous chair. Danish modern is my all time favorite style. So timeless and chic! Wow! That didn't take long at all. I love the stripes. It's very classic and chic. wow Alli - I love Modern Danish furniture and that chair is no exception - especially with it's new look. You did such a good job bringing it back to life & it looks lovely. I have a chair that I brought too reupholster too, only it's been sitting around for months as college has been too busy :( this definitely inspired me though!